1. 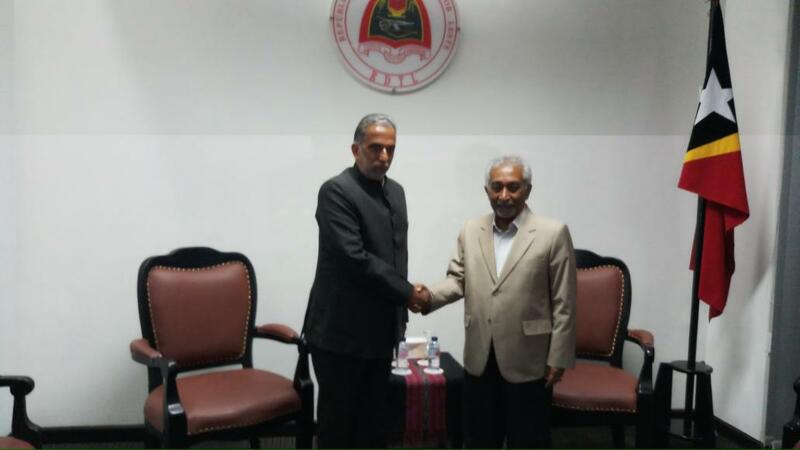 Mr. Krishan Pal Gurjar, Hon’ble Minister of State for Social Justice and Empowerment, Government of India visited Dili, Timor Leste from 7-10 April 2018 as Special Envoy of the Government of India. 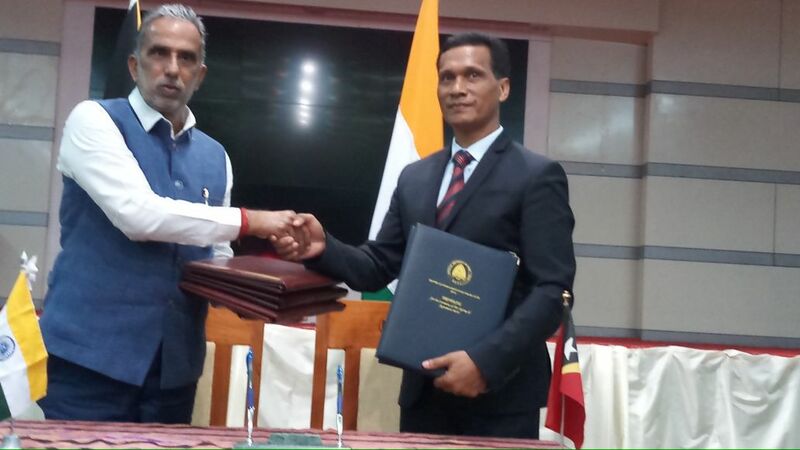 The visit was aimed at strengthening the bonds of friendship between India and Timor Leste. 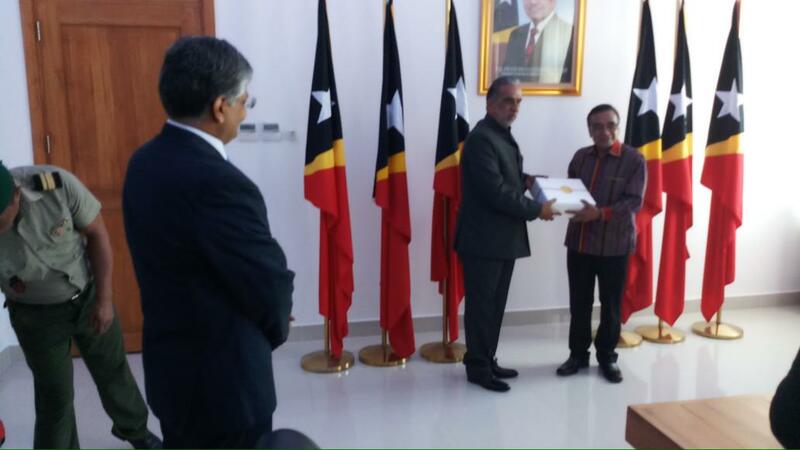 2.​ During his visit, Hon’ble Minister called on the President of Timor Leste H.E. Dr. Francisco Guterres Lu Olo. The Hon’ble Minister extended an invitation from the President of India to the President of Timor Leste to visit India at an early date. The President of Timor Leste accepted the invitation and said that it is an honour for the country and people of Timor Leste to receive the invitation. It was agreed to work out the concrete details of the visit through diplomatic channels. 3. Hon’ble Minister also called on the Prime Minister of Timor Leste H.E. Dr. Mari Bin Amude Alkatiri, and met with Minister of Foreign Affairs and Cooperation H.E. Prof. Dr. Aurelio Guterres and Minister of Justice H.E. Ms. Maria Angela Guterres Viegas Carrascalao. The Minister also had the opportunity to interact with the Minister of Tourism H.E. Mr. Manuel Vone and Minister of Education and Culture H.E. Prof. Dr. Fernando Hanjam. 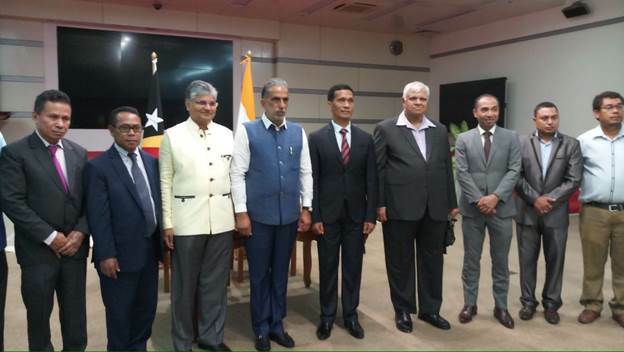 In his discussions with the Timor Leste leadership, Hon’ble Minister conveyed India’s strong desire to partner with Timor Leste in its socio-economic development projects and asked the Timor Leste side to suggest projects based on its own priority and needs assessment. 4.​ Recognizing the need to enhance and expand the areas of cooperation between the two countries, the two sides agreed to have enhanced interaction through bilateral institutional mechanisms to further strengthen the existing friendly ties between the two countries. Hon’ble Minister also recalled the historic ties between Goa and Timor Leste and extended an invitation to a delegation to visit Goa to explore their ancestral and heritage linkages. 5.​ Hon’ble Minister briefed the Timor Leste leadership on the successful holding of the Founding Conference of the International Solar Alliance (ISA) Summit in New Delhi in March 2018 and invited Timor Leste, which is one of the prospective member countries of ISA, to join the Alliance. 6. During the visit, a Memorandum of Understanding in the field of health care and public health was signed between the two countries. The MoU, which was under discussions for more than 5 years, would open new avenues of cooperation in extension of affordable health care to people of Timor Leste. India offered to share its experience and expertise in matching information technology with health care through telemedicine. 7. Timor Leste side briefed the Minister on their developmental priorities and expressed a desire to expand cooperation in building of infrastructure, education sector including IT and English language, maritime sector to address the issue of illegal fishing and development of fisheries and agriculture sector. The two sides agreed to further develop cooperation in capacity building. 8. Hon’ble Minister concluded his visit by delivering a public lecture at the Ministry of Foreign Affairs and Cooperation on the theme “Indian Foreign Policy and Modinomics”. The lecture was attended by civil servants, diplomatic community and the local media. 9.​ Overall, the visit was successful in reinvigorating the historical cultural connection between peoples of India and Timor Leste and reaffirming convergence of interest between India and Timor Leste based on shared commitment to values of democracy, pluralism and inclusiveness and respect for rule of law.